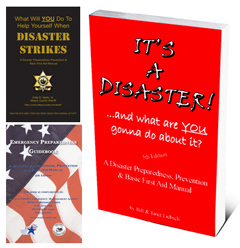 Keep in mind we discount our 266-page disaster preparedness and basic first aid manuals up to 75% off list (or as low as $3.50 U.S. each) … and we customize them in the print process on 1,000 unit (or larger) quantities at NO additional charge. On large jobs (20,000 units or more) we can add an extra 48-page section so communities, regions or corporations can have 60 custom pages in front (or back) creating a very substantial reference manual. In smaller quantities and on rush orders we can customize our “standard” red books with free peel and stick labels. It’s not as cool as a custom book, but it allows volunteer groups, nonprofits, agencies, schools and businesses to personalize books for their recipients. One final note, many states will be closing out year-end budgets on June 30th … and others are receiving grant funds for relief and recovery efforts. A great way to clear out leftover funds and grant dollars is to purchase customized IT’S A DISASTER! 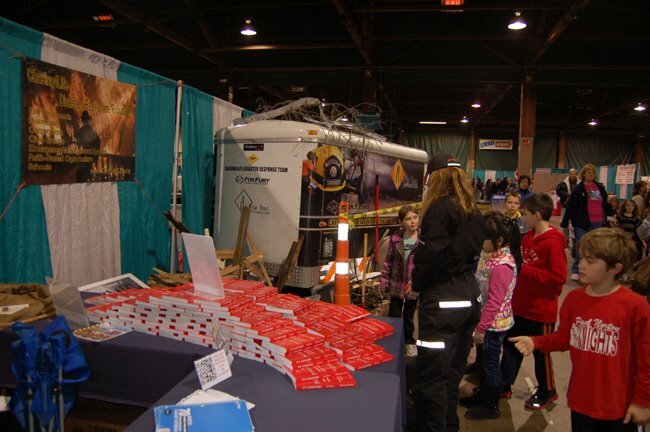 books for staff, volunteers and local citizens. Fedhealth can individually receipt each bucket to commit funds down to the penny so groups won’t be required to return any unused dollars. Paperbacks (or CDs or flash drives) qualify as community education providing about a $4-to-$1 match due to all the discounts.